Chiropractors in the Military?…hold your salute for now. So goes a statement that’s all too common to the ears of our profession — this one was issued in 1991 by the then Secretary of Defense, Richard Cheney’s Deputy Assistant Secretary, Edward Martin, M.D. Our much anticipated “radio-style” chiropractic podcast is now on! “Tune it in” at SpinalColumnRadio.com, and listen to Dr. Lamar talk about the topics he writes about here on this blog. 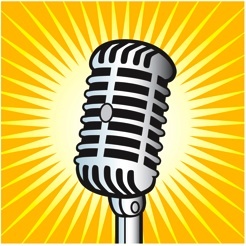 This "Old-Fashioned Radio Microphone" icon will take you directly to the podcast the article is about. This one will take you to "Episode 000"
Keep an eye out for the “Old-Fashioned Radio Microphone” icon in the articles appearing throughout our Blog, as they will link you directly to the Spinal Column Radio podcast for that article’s topic. Click on the the microphone icon in this post to go directly to our very first episode entitled “Episode 000 — podcast chiropractor for hire!” In this episode you will learn the who, what, and why of Spinal Column Radio. It’s fun, informative, and thought-provoking — all at the same time…. “infotainment” at its finest!